The goal of this guide is to enable the reader to understand the performance of Scanner graph execution and how performance can be improved by tuning execution parameters. You can view this file by going to chrome://tracing in the Chrome browser, clicking “load” in the top left, and selecting resize-graph.trace. Let’s walkthrough how Scanner’s execution of a graph is visualized in this interface. But first, we need to explain how Scanner actually executes a graphs. Within a single worker process, Scanner implements a replicated pipeline execution model to achieve parallelism across CPUs and GPUs. At a high level, pipeline execution breaks up the computation graph into distinct pipeline stages, which are each responsible for executing a subset of the graph, and these stages are hooked together using queues. 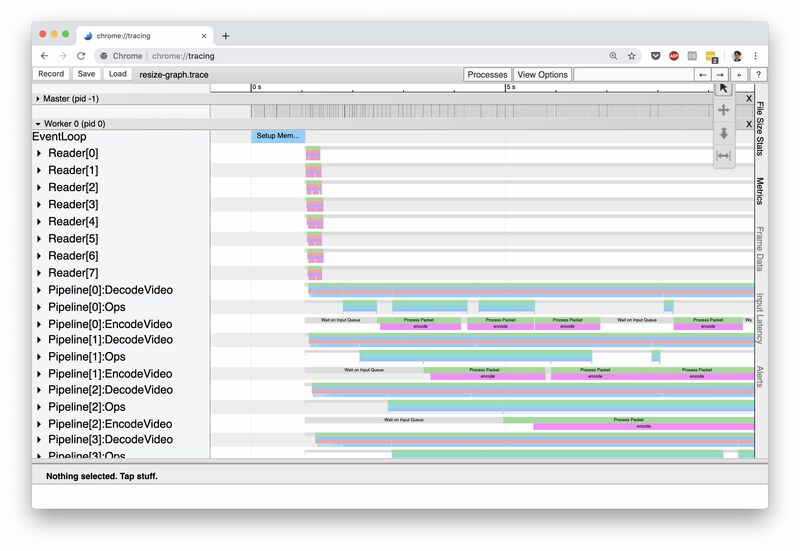 For example, in the above trace screenshot the rows correspond to distinct pipeline stages: Reader[X], Pipeline[X]:DecodeVideo, Pipeline[X]:Ops[Y], etc. Each row contains the trace events for the labeled pipeline stage. The number inside the square brackets, [X], represents a replica of that pipeline stage. Each replica of a pipeline stage can process data in the graph independently, and thus the number of replicas controls the amount of parallelism for a pipeline stage. Reader[X]: responsible for reading data from the input stored streams to the graph. 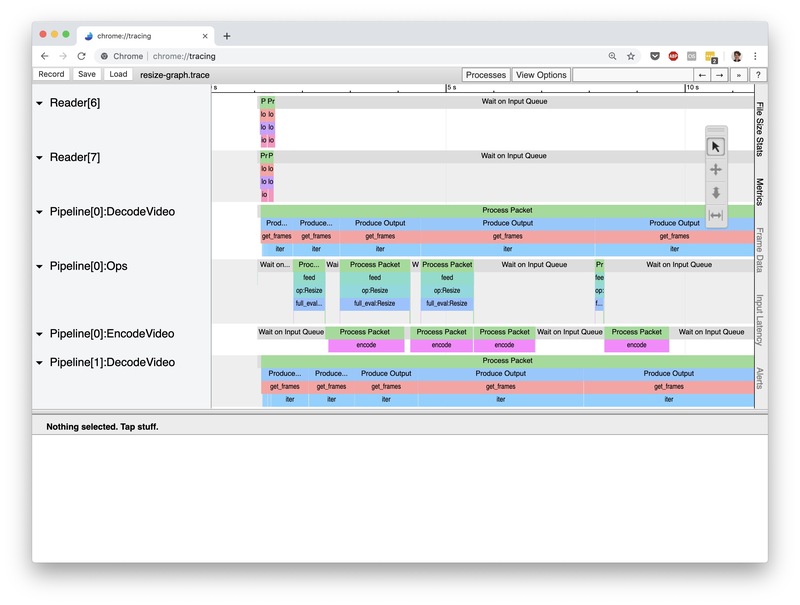 Pipeline[X]:DecodeVideo: responsible for decoding compressed video streams from readers. Pipeline[X]:Ops[Y]: handles executing a portion of the computation graph. If a computation graph has operations that use different devices (CPU or GPU), then Scanner will group operations together based on device type and place them in a separate pipeline stage. These separate stages are indicated by the Y index in Ops[Y]. Pipeline[X]:EncodeVideo: responsible for compressing streams of video frames destined for an output operation. Writer[X]: responsible for writing data from the outputs of the graph to the output stored streams. 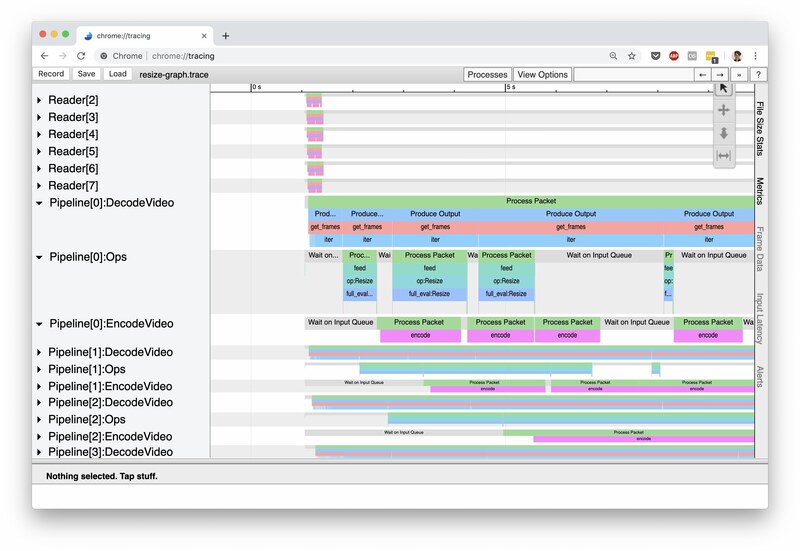 Notice how the timeline for Pipeline:DecodeVideo is constantly occupied by processing events, while Pipeline:Ops has a large amount of idle time (indicated by the gray “Wait on Input Queue” events). This immediately tells us is that this computation graph is decode-bound: the throughput of the computation graph is limited by how fast we can decode frames from the input video. work_packet_size (int) – The size of the packets of intermediate elements to pass between operations. This parameter only affects performance and should not affect the output. io_packet_size (int) – The size of the packets of elements to read and write from Sources and sinks. This parameter only affects performance and should not affect the output. When reading and writing to high latency storage (such as the cloud), it is helpful to increase this value. cpu_pool (Optional[str]) – A string describing the size of the CPU memory pool to initialize. If none, no memory pool is used. gpu_pool (Optional[str]) – A string describing the size of the GPU memory pool to initialize. If none, no memory pool is used. pipeline_instances_per_node (Optional[int]) – The number of concurrent instances of the computation graph to execute. If set to None, it will be automatically inferred based on computation graph and the available machine resources. queue_size_per_pipeline (int) – The max number of tasks that a worker will request from the master for each pipeline instance. This influences the amount of data that can will be resident in memory at once. For new users to Scanner, we recommend using the scannerpy.common.PerfParams.estimate() method to have Scanner automatically set these parameters based upon inferred properties of your computation graph. More advanced users that understand how these parameters influence performance can make use of scannerpy.common.PerfParams.manual() to tune the parameters themselves.